PAGE IS IN PROGRESS AND DOES NOT REFLECT THE EXTENSIVE HISTORY WE HAVE ON PATRICK LOSTY. Patrick Losty, of Kildare County Ireland was born in 1825. He is the son of Matthew J. Losty and Mary Jane (unknown) Losty. At the time of Patrick's birth, his mother was 45 years old and sometime between the time of his birth and his 18th birthday, Patrick suffered the loss of his father as did Mary Jane and the rest of the family. He is buried somewhere in Ireland, most likely close to Halverstown which is where his wife Mary Jane originated and their son John Losty baptized his daughter Bridget Losty. 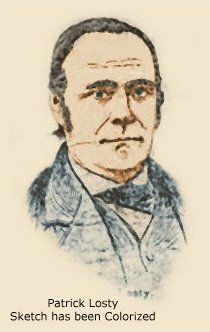 In 1843 at the peak of the potato famine in Ireland, Patrick Losty, age 18, left Halverstown, Kildare County Ireland, with his widowed mother Mary Jane Losty 63 years of age, and headed for the United States of America arriving in 1843. Patrick's brother John Losty, whose birth year is unknown remained in Ireland and later married Miss. Julia Byrne. Patrick and his mother Mary Jane Losty arrived three years after the 1840 US Census was taken so it is unknown exactly where in New York they landed and who met them, if anyone, when they arrived. In 1850, we find a Patirck Listee age 25 working as quaryman in New York boarding at ( ). We do not know if this was our Patrick, but for the sake of future investigations we have listed this person and the census record he is found in - just in case he might turn out to be our Patrick. Note: Our research team has, time and time again found variations in the surnames of other family member surnames, who are related to the Losty's; and we suspect the name Listee, may be a variation of the name Losty. There are other variations of the name Losty listed the Ireland Genealogy pages found online such as: Lasty, Lusty, and Lofty, however, we have seen no signs of misspellings in the surname Losty related to our family in the United States until now. We suspect, Patrick Listee, occupation quaryman, age 25, born in Ireland, was at work when the 1850 US Census was taken. He was boarding in a household with many other men, so it would be safe to assume, Patrick was not the one providing the information about himself to the census takers, but rather, whomever was at home the day the census was taken. We have no knowledge of this persons ability to speak, read, or write English and we theorized, when asked, who lives in the household in question, the responder provided the names of the individuals verbally and Patrick Losty came out sounding like Patrick Listee. Sandra Losty, of Ireland, was recently questioned in 2004 regarding Irish accents. She gave the opinion the name "Losty" spoken with a heavy western Irish accent would sound like 'Listee". However, we cannot say definatively this is our Patrick and this information is only listed here for future reference - it may or may not be a piece of our puzzle. With that said our story about Patrick Losty resumes in 1847 when he married his bride Miss. Mary Roughan in New York. Mary and Patrick's destination in the United States is unknown. 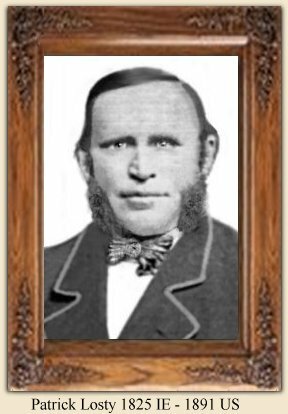 However, Patrick Losty was in Cannan, New York in 1850 and then later moved to West Stockbridge, Massachusetts as noted in the 1860 US Census. Patrick Losty married Miss. Mary Roughan and all of their children were born in the United States. remembered and missed by the people of State Line and by many acquaintances in other parts, as a gentleman at all times, honest and honorable, who had the welfare of his fellow men at heart and the courage of his convictions which were at all times of a dignified and Christian nature. His funeral was largely attended on Sunday from St. Patrick's church, West Stockbridge. The funeral procession was the largest ever seen there, there being 168 teams in line, 26 of which were covered coaches. His pall bearers were his four sons and two sons-in-law.